Making a major move? Practical advice for relocating with your cat. Relocating with your cats is not as traumatic or impossible as you may think, but the process does require some forethought. Check out our tips for making the event safer and less stressful for all of you. 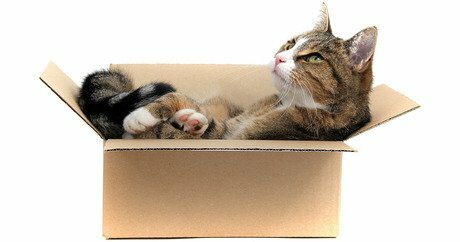 During the truck-loading phase of your move, tuck your cats away in a safe place (such as a bedroom or bathroom) so they don’t escape through open doors or get hurt. They’ll appreciate being out of the chaos, too. Have clean carriers set up with a towel and a small litter pan (plastic storage boxes that fit along the back of the carrier work great). Feed your cats an hour or two before you leave, giving them time to use the litter box beforehand. Barring any medical conditions, most cats will be all right without food for 8 to 10 hours. If your cat has a medical condition, check with your vet on this before you go. Always keep your cat in a carrier while in the car, and never open car doors and kennel doors at the same time! Place identification collars and tags with cats’ name, your name, and phone number on each kitty. Collars should fit so that two of your fingers can slide between it and your cat’s neck. Carry a folder with vaccination and medical history, a photo, medications in your travel bag. For long distance trips, locate a few veterinarians along the way just in case, and write down the phone numbers. Don’t get stressed out if your cats meow a lot in the car — they probably will. Just stay as calm as you can and reassure them often. Music may help, but resist the temptation to drown them out with loud music. That will just stress you — and them — even more. If your trip includes overnight layovers in hotels, call ahead to make sure the hotel is pet friendly. Get all belongings inside and secure the door before opening the carriers. If you must go in and out later, pay attention to avoid escapes. Cats will always find somewhere to hide in the room, usually under beds or behind furniture. Check to see what’s movable should you need to extricate someone! A separate bathroom/changing area may be the best place to set them up overnight with food, water, a regular size litter pan, and a bed or blanket from home. Reassure them and stay calm. Cats can be amazingly adaptive to new circumstances as long as you are there too! If your move involves air travel, check with airlines and health departments of each state you stop in regarding vaccination requirements. Follow these regulations to the tee to prevent your pets from having to be quarantined. Once inside your new place, tuck the cats into a safe, quiet room while you unload. Set the room up with their familiar toys and beds, and put a note on the door to alert helpers so the door isn’t accidentally opened. Lastly, take a moment to relax. The hard part — at least in feline terms — is behind you.